For challenge # 34, make a card, LO or craft project for Easter using any colors, but no bunnies or chicks. I used the tree from Wild Card cartridge, the eggs from Doodlecharms, and the butterfly is from Indie Art. I stamped it with the Easter stamps from Studio G. I think the Easter tree is so cute! I wish Easter eggs grew on trees! Challenge # 18 is to make an Easter card using any cartridge(s) and any colors you'd like. Here is my card, sweet and clean! I used doodlecharms for the basket and the eggs. I put the basket through the paper crimper to make it look like a wicker basket. I ran some of the eggs through the cuttlebug and used some ink in them the other I used glue and sparkle. Thanks for looking! So I have two little chicks, 9 and 8... and my little one is my little rebel. She certainly keeps me on my toes. I recently picked up the Indie Art Cricut Cartridge because I love all the easy shapes, especially the skull and cross bones. She of course thought it was rockin' and cool. That is her... my little rebel in pink hair bows! My older chick thought it was scary and asked me to replace it with a watermelon cut- out instead ! She went as far as finding the design in the stretch your imagination booklet! My chicks really are my inspiration! They give me so many ideas! All you need to do is make a pretty spring project using stamps. Of course, your project must also include a Cricut cut. I'm ready for another challenge! The requirements are: Make a card, LO or craft project using 1 ribbon and 3 buttons. Use any colors or theme that you'd like. Here is my entry for the paper cutz challenge # 33. This week's challenge is to make a card for a child's birthday (boy or girl) using any cartridge(s) or colors you'd like. I made a card that I would give to one of my chicks! They loved it! This is my card for the paper cutz challenge # 32 anything goes! I used scal for the dancer and the paper is from the new flower stack. 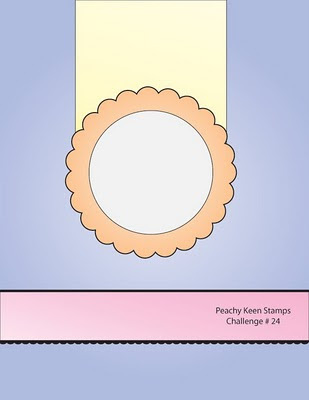 This is my first challenge for peachy keen stamps! I am so excited! I believe I have an older set of peachy keen stamps, it is the PK-504. 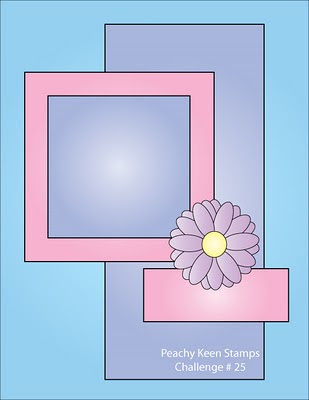 The challenge was to design a card using their design and you must you a peachy keen stamp. Here it is! So this is my first challenge! This week's challenge is to make a card for Spring using flowers, birds or butterflies from any cartridge(s) and using any colors you'd like. I made this using the Cricut Cartridge Walk in my Garden. I am just in love with the New Arrival Cricut Cartridge! It is primarily for babies, but it has so many cool features! I don't know anyone that is pregnant, or is trying, or have any relation to anyone that has a baby, but I cannot help myself, I just keep making baby cards! They are just to cute not to! A new website is just starting! Some of my videos are being used as tutorials! It is so exciting! Take a look and become a member. Look for the "Bee"... that's me! and link to be friends! I decided to do a video on how to make the gift box using the Wild Card Cartridge. I really like how cute this box is and I filled this one with Candies so it is even better!